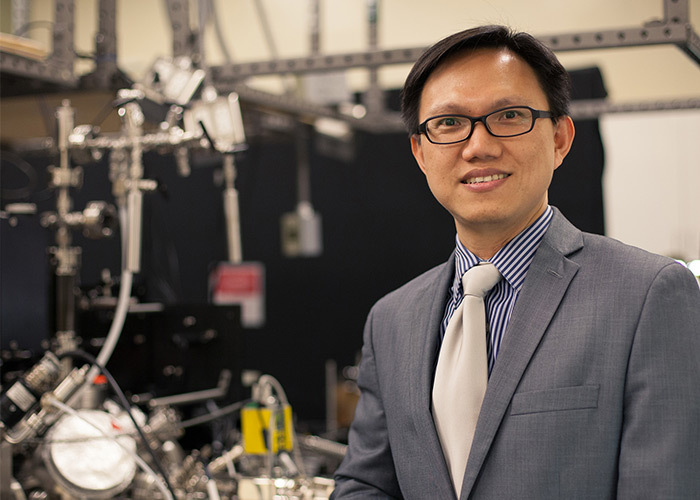 In a collaboration between Samsung, the University of Houston, and Ulsan National Institute of Science and Technology, Ding-Shyue “Jerry” Yang, assistant professor of chemistry, will work on characterizing new properties for low-dimension optoelectronic compounds. Yang, an assistant professor in chemistry, specializes in ultrafast electron microscopy and diffraction.“This exploratory research is a new collaboration, with the potential for renewal,” said Yang, who has been a faculty member in the College of Natural Sciences and Mathematics since 2012. Optoelectronic compounds are materials that respond to light, providing an electronic response. Examples include the photovoltaic materials used in solar panels. Yang’s specialty is ultrafast electron microscopy and diffraction. These techniques, which use electrons rather than photons, are still highly specialized. Samsung wants to see if these new methods can be used to study specific materials they are interested in, such as those used in energy applications. To get this capability, Yang uses a microscope he built himself, a process that took three years. The advantage of these methods is that they can obtain laser-induced ultrafast electronic and structural changes at an atomic level, which cannot be acquired or resolved by traditional analytical tools. Yang’s research group will be looking at low-dimension optoelectronic compounds, testing out how the properties of these materials change at different scales. “Reducing the dimension of these materials can change their properties, potentially opening up new applications,” Yang said.